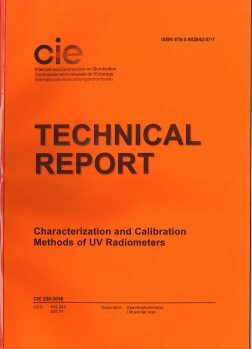 This thechnical document prepared by CIE Technical Committee TC 2-47 describes quality indices for UV radiometers, which are helpful for manufacturers and users to characterize instruments on a common basis. To harmonize CIE documents, the quality indices described in this document relate to the quality indices describe in Joint ISO/CIE International Standard ISO/CIE 19476:2014(E) (formerly CIE S023/E:2013), and references are made to those where applicable. This document also describes source-based and detector-based methods along with measeurement conditions and limiting boundary conditions for the calibration of UV radiometers used for laboratory as well as industrial applications. The publication is written in English, with a short summary in French /German. It consists of 52 pages with three figures and three tables and is readily available at the NSVV or via the CIE-Webshop. The price of this publication is € 135,-. Leden van de NSVV krijgen hierop 66,7% korting!